p.s.s. I noticed in Cure Freaks "Robert" how he was wearing a tied (on the side) thick white head band, before a concert, to keep he' hair up- I think. Ohh Tof you got Roberts shoes, ahha !! wake wakee- thats the ones Now I want 'em too. and yes, I'm wearing them now. But I think I get a bit confused, am I seducing or being seduced? I'm not wearing any shoes at all. Today ~ yes iam wearing these, shouldve taken my puff-ish jacket off, looks massive... but just bit cold outside this evening. What kind boots are they AlluivialL ? Love 'em. 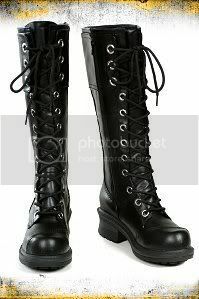 ~ Luv Doc's also, but I like the bigger heel, like yours. I had a pair similar, but not as high, could never find the same pair again, and ohh how i looked. The pair iam wearing resemble motor bike boots, very much, but arent- although can be, and got them at a factory 'sale'. ~~~~ ~ ~Where are Cure Freaks Shoes ??? ohh did i miss something- Hello Cure Freak show me your shoes, pwease. . . . .never realised i had a shoe fettish before, but dont all girls ? Love Shoes !! 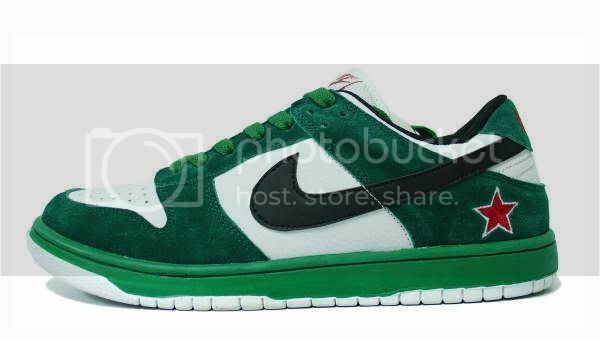 Heineken Nike's! I don't own a pair, but damn I love them. Ohh they're awsum They remind me of the old 'Motley Crue' shoes,- white with red slash, and more like basketball. But they are cool as. Even better actually !! They're Nana Black Overlay Pole Climber Boots, heh. No fair!!! I want big rock boots! lol, those are friggin awesome! Hmm, who's boots are you talking about Carnage Visor? You're shoes are really cool AlluivialL!!! I was talking about yours, Alluivia, I just can't spell your name from memory! Oh, ^_^ Thanks. The only place I know of is Hottopic.com, or ebay. well, in the US at least.